The early naturalists had a gift for description you just don't see anymore. 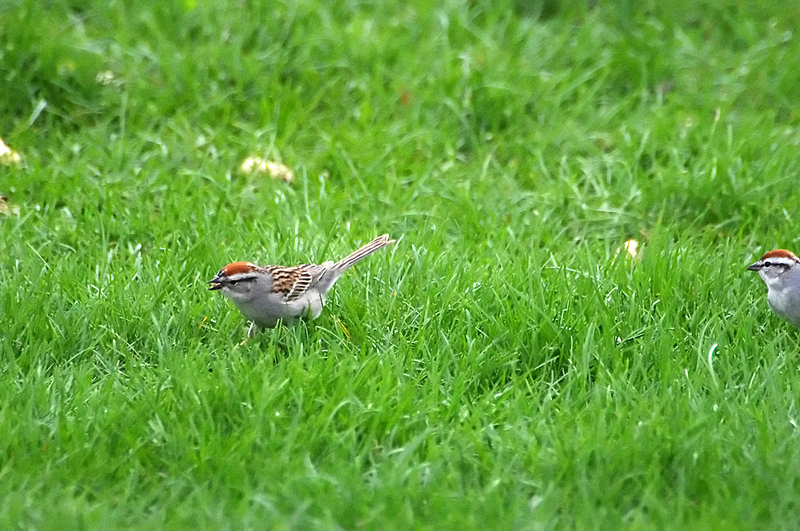 In 1929, Edward Forbush called the Chipping Sparrow "the little brown-capped pensioner of the dooryard and lawn, that comes about farmhouse doors to glean crumbs shaken from the tablecloth by thrifty housewives." 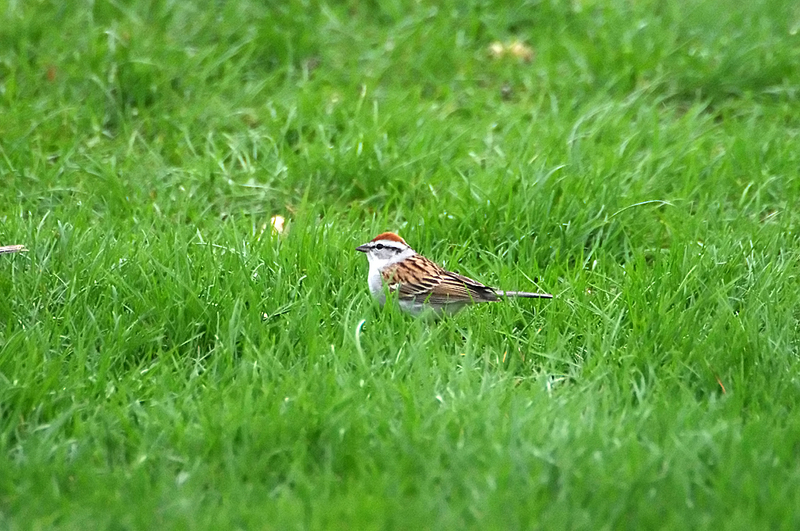 The oldest known Chipping Sparrow was 11 years, 10 months old. 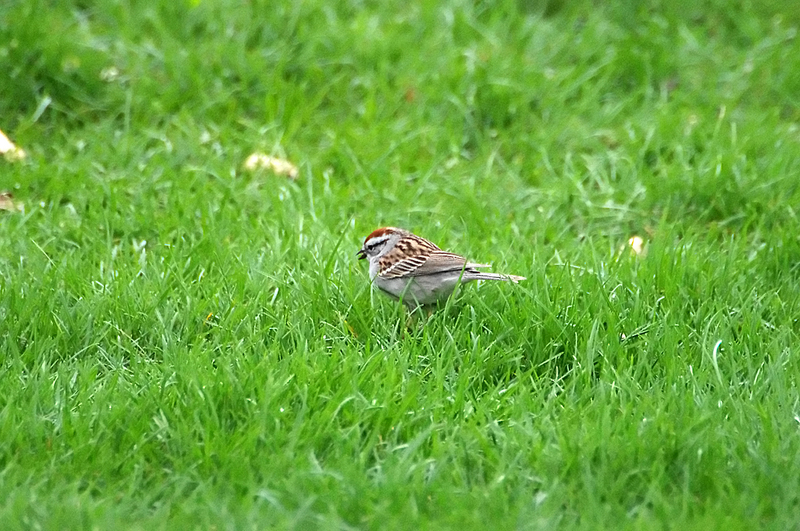 You'll find Chipping Sparrows around trees, even though these birds spend a lot of time foraging on the ground. Look for them in grassy forests, woodlands and edges, parks and shrubby or tree-lined backyards. 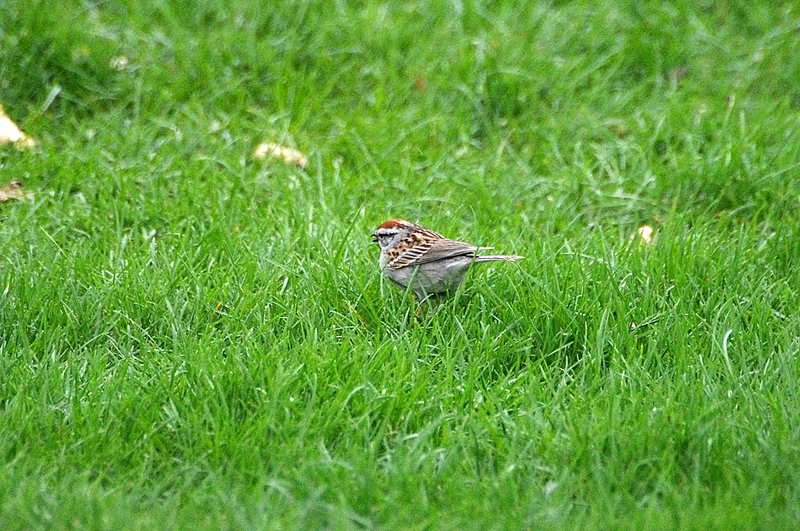 Chipping Sparrows seem to gravitate toward evergreens in places where these trees are available. They also use aspen, birch, oak, pecan, and eucalyptus trees. 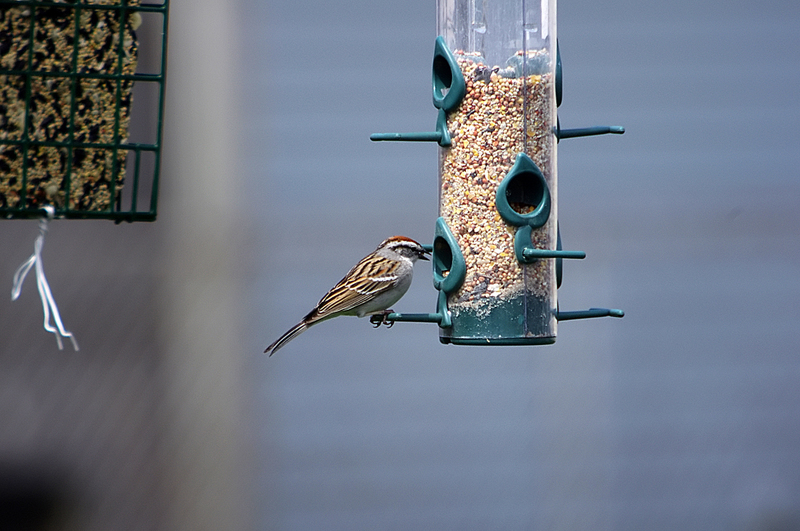 In the mountains, you can find these birds all the way up to treeline. 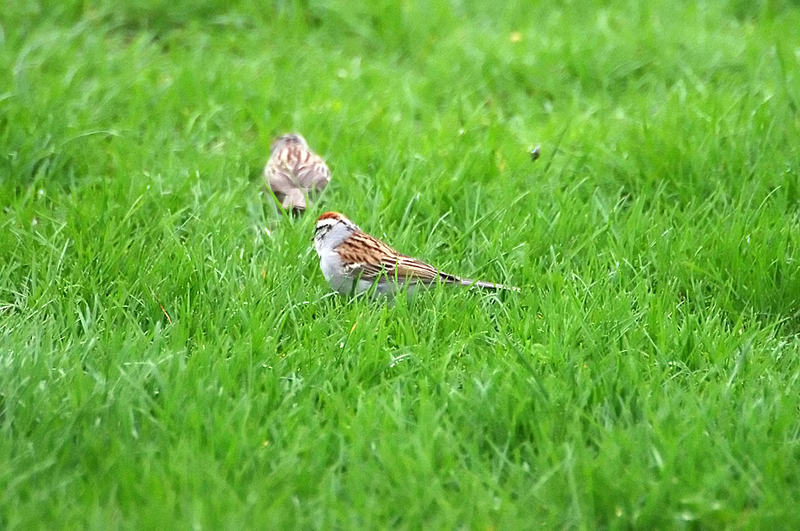 In summer, male Chipping Sparrows defend territories against other Chipping Sparrows, but often tolerate other species as long as they don't go too near the nest. 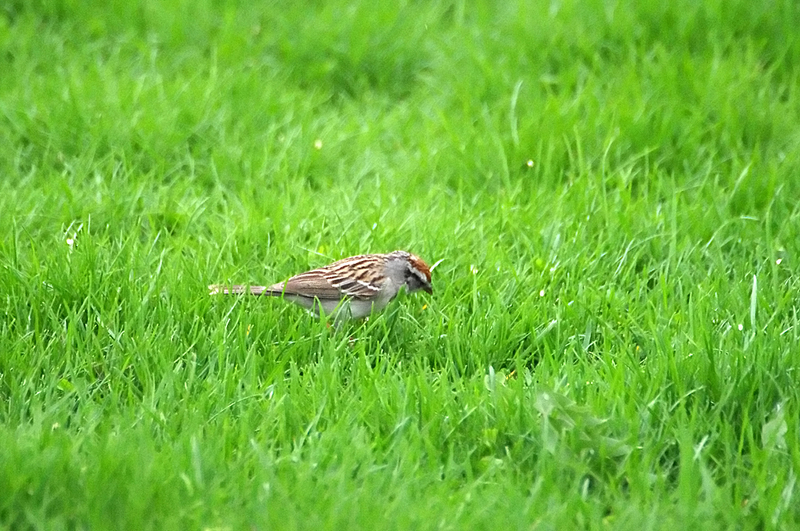 After the breeding season, Chipping Sparrows form flocks of several dozen, foraging together among grasses and at bird feeders. Their flight pattern is energetic, straight, and only slightly undulating. 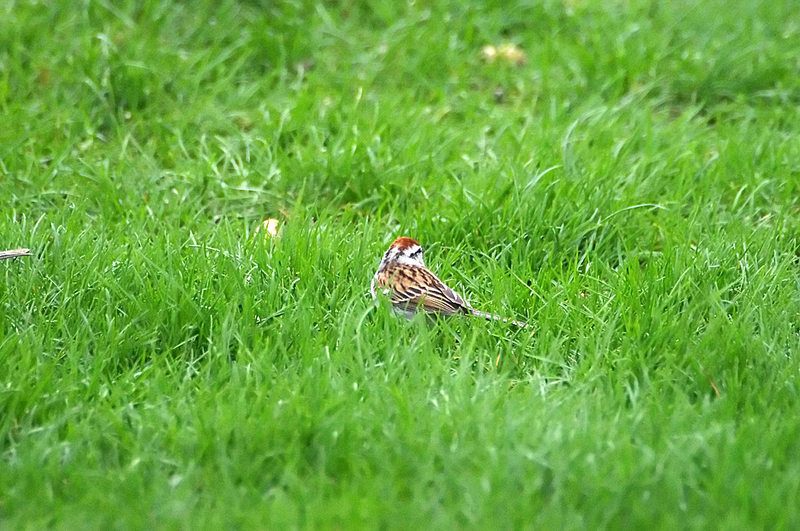 Chipping Sparrows mainly eat seeds of a great variety of grasses and herbs. 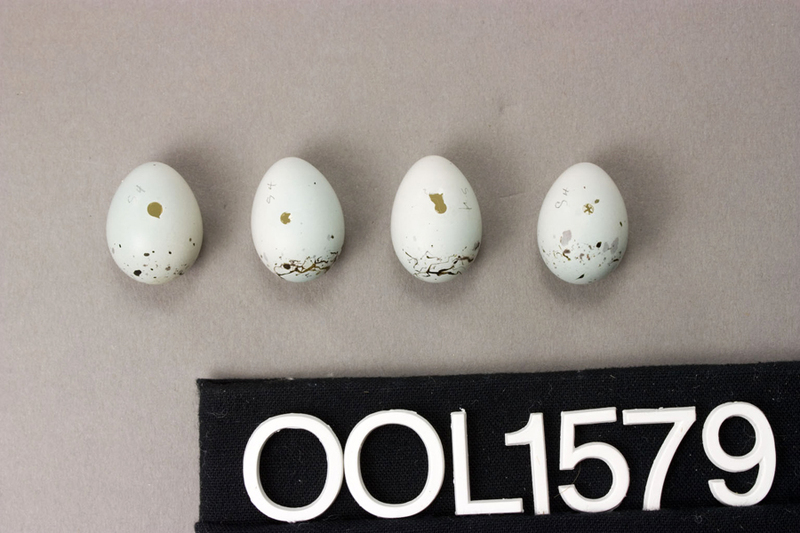 During the breeding season they also hunt for protein-rich insects, and these form a large part of their summer diet. 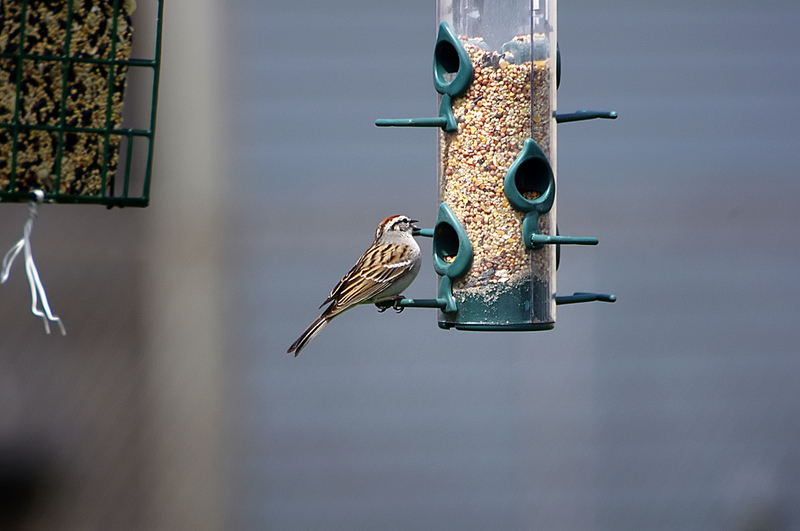 Chipping Sparrows sometimes eat small fruits such as cherries. 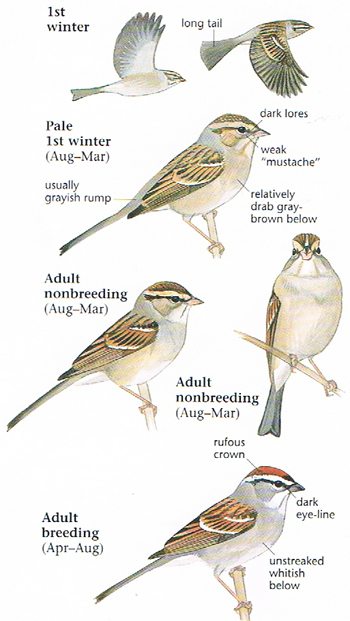 American Tree Sparrow has a spot in the middle of the breast, a bicolored bill (black above, yellowish below), and a rufous, not black, stripe through the eye. 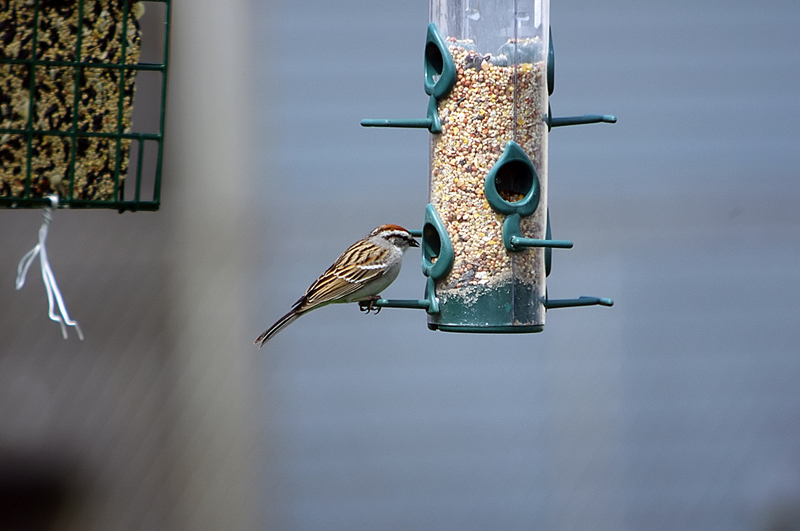 Field Sparrows have a bright-pink bill, duller crown, and distinct eye ring. 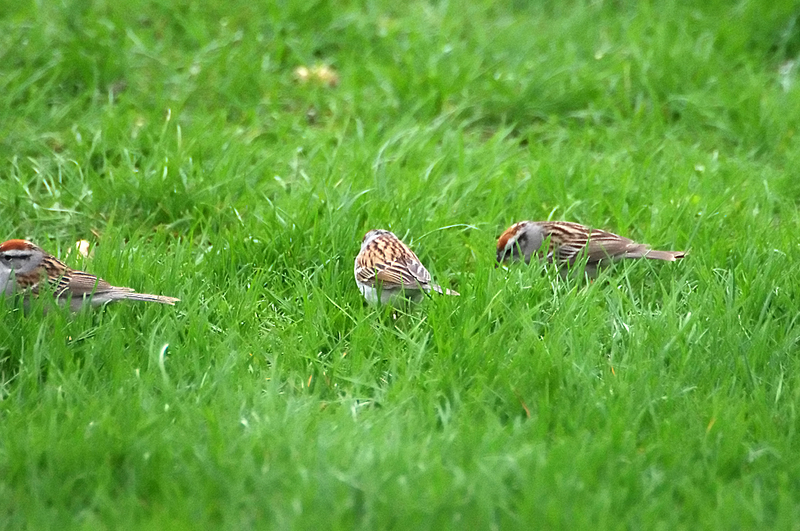 Juvenile and winter Chipping Sparrows can be confused with many other sparrows. 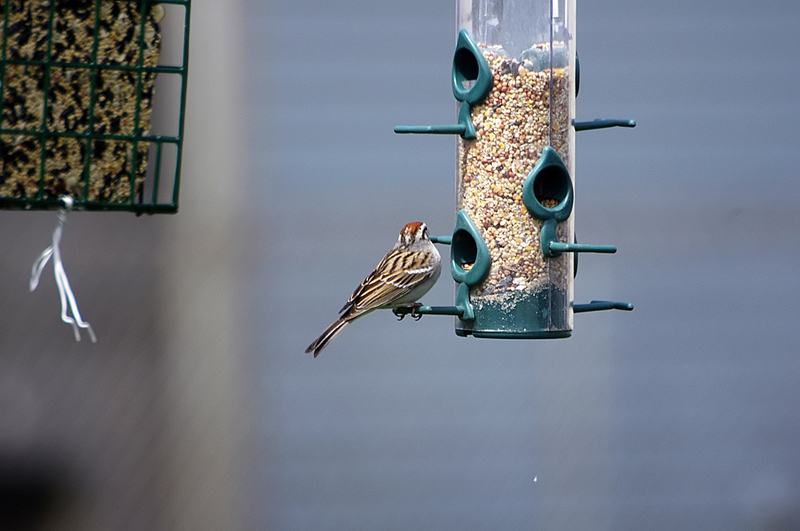 Look for Chipping Sparrow's gray rump when it flies. 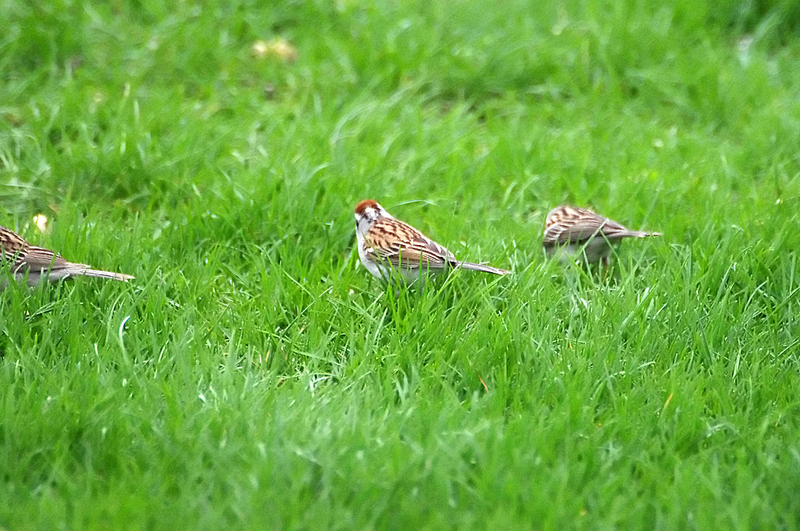 Male Chipping Sparrows sing a long, dry trill of evenly spaced, almost mechanical-sounding chips. It's one of the most common sounds of open woods in spring - but be careful, because Dark-eyed Juncos sound very similar (though a bit more musical) and often live in the same habitats. Songs are about 3.6 seconds long on average, consisting of around 55 nearly identical chip notes in a row.